Included in the book are lists of descriptive words, idioms, expressions related to moods, story starters, problem-solving topics, words organized by speech sounds, difficult-to-pronounce words, absurdities, and more. Language Word Lists. This section includes lists of common regular and irregular verbs, synonyms, antonyms, homographs, homophones, spatial concepts, basic sight words, and words organized by number of syllables. Category Word Lists. This section includes lists of words organized by category and by common features. 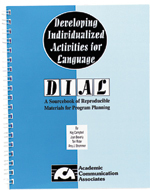 These lists can be used to select vocabulary for categorization activities and for activities in which students make comparisons, describe similarities and differences, etc. Language Expression and Problem Solving. The lists in this section include phrases, sentences, story situations, and discussion topics. Use these lists to strengthen verbal expression and problem solving skills.